The only official document on the ‘known health impact’ of fireworks is a compilation of findings of surveys, put together by Central Pollution Control Board. In November 2016, as a great smog enveloped Delhi for days after Diwali, the Environment Pollution (Prevention & Control) Authority (EPCA) told the Supreme Court that the capital’s terrible air quality had been “compounded” by the burning of firecrackers. The EPCA is the pollution watchdog that the central government created for the National Capital Region, based on a 1998 order of the Supreme Court. Following the EPCA’s submission, the court ordered the Central Pollution Control Board (CPCB) under the Ministry of Environment, Forest and Climate Change, to study the harmful effects of firecrackers. Ten months later, in September 2017, the court said it was “disturbed” to note that its order had not been complied with. While the CPCB did not carry out the detailed study that the Supreme Court asked for (it said the competence lay with the Petroleum and Explosives Safety Organisation (PESO), the explosives regulator under the Ministry of Commerce and Industry), it did review existing literature on the subject, and put together a summary, which was submitted to the court. 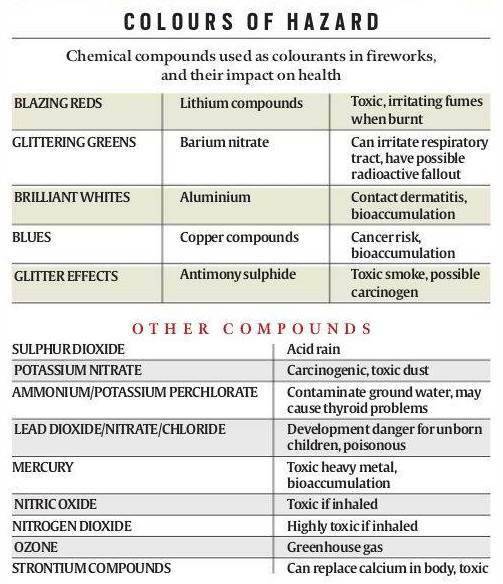 It listed the “known health impacts” of fireworks, going into the chemical processes of what makes them emit light and sound, and the toxic substances that are spread in the atmosphere during the process. How a specific exploding firework performs depends on how its four primary ingredients — oxidiser, fuel, colouring agents, and binder — combine. Burning requires oxygen — the oxidisers in fireworks are chemicals that release oxygen to allow the explosion to take place. Nitrates, chlorates and perchlorates are used most commonly. Fires need fuel to burn; the commonest fuel in Indian fireworks is charcoal, says the CPCB. The combination of fuel and oxidiser — or gunpowder — causes the explosion. Colouring agents are chemical compounds that give fireworks their colour. Aluminium compounds produce brilliant whites, barium nitrate produces greens, and the addition of copper results in blue light. Binders, according to the CPCB’s submission, “are used to hold the mixture of the firework together in a paste… the binders don’t actually begin to work until the firework has been lit and are potentially dangerous”. So, in the case of a rocket, the combination of fuel and oxidisers, or gunpowder, propels the firework upwards. The fuse has finer particles of gunpowder that burns the charge at a controlled rate, giving the person who is lighting the fuse time to step back. The burning charge then lights up the larger particles of gunpowder at the bottom of the firework, and the resultant explosion fires the rocket up in the air. Pellets of gunpowders packed into its body are ultimately what burst it apart. Binders, most commonly a starch called dextrin, binds the fuel oxidisers and colourants into these pellets. The colourants determine what colours are seen as the rocket explodes. The CPCB affidavit refers to four types of explosive firecrackers — atom bombs, chinese crackers, garland crackers and maroons — for which guidelines exist. According to the NGO Centre for Science and Environment, the guidelines for these four categories — out of 40 notified categories — were drawn up by PESO in 2008 after the Supreme Court ordered the Department of Explosives (as PESO was then called) in 2005 to notify regulations regarding the recommended and permitted composition of each type of firecracker. According to these guidelines, the sulphur content must not exceed 20%, nitrates 57%, and aluminium powder contents, 24%. The guidelines were silent on heavy metals such as cobalt, copper and magnesium, extremely toxic compounds of which are widely used as colouring or regulating agents. It was only in July 2016 that the Supreme Court ordered that “no firecrackers manufactured by the respondents shall contain antimony, lithium, mercury, arsenic and lead”, and that it was the “the responsibility of the Petroleum and Explosives Safety Organisation (PESO) to ensure compliance”. Studies in Europe, Canada and China have found links between increases in the concentration of fireworks, and variations in air quality. Most of these studies have focused on festivals such as the Yanshui Festival in Taiwan, Montreal International Fireworks competition, Lantern Festival in Beijing, Guy Fawkes Night in the UK, etc. The European Respiratory Society says all fireworks contain carbon and sulphur — which are necessary for burning — apart from a wide range of chemical compounds. A 2007 study, ‘Recreational Atmospheric Pollution Episodes: Inhalable Metalliferous Particles from Firework Displays’, published in Atmospheric Environment, had found that children were susceptible in particular, since their defences against particulate matter and other gaseous air pollutants were weaker. Also, children engaged in greater physical activity, increasing the intake of polluted air into their lungs.